Keeping the Pounds Off! : How Bad was the Titanic TV Movie? How Bad was the Titanic TV Movie? "By the end of the movie I was rooting for the Ocean." Ever since I was a child and my aunts told me how my grandmother's brothers, coal stokers on the shop, were killed when the Titanic sank, I have been a Titanic buff. Read everything, saw everything, memorized it all, including Clive Cussler's Raise the Titanic. I've been to the museum here in Orlando a few times. I drove 100 miles once to see the traveling exhibit. When I was an adult and could find the list of those who were on the ship I realized my aunts lied through their tar and nicotine stained teeth were incorrect. No one with my paternal grandmother's maiden name was even on board. This week's TV movie was the worse piece of story telling I have ever seen. There was literally NO character I cared to see live through the disaster. When you cannot even like the poor kids. . . .it is really bad writing. This has absolutely NOTHING to do with keeping the pounds off. Or does it? Everyone knows the story of the Titanic. We know it goes down. We know most people died. We know some people made it harder for others to live. In a way, this is the story of many obese people. We already know the story. We can see the ship going down. We know people are dying and we know in enabling others, it makes it harder for some people to live. But still we watch and wait, and hope. Maybe this one will reach for the lifeline? Maybe that one will find a better way off the sinking ship. Maybe, just maybe someone will find a way to stay afloat and alive long enough a lifeboat to come by and pull them to safety. Or maybe not. 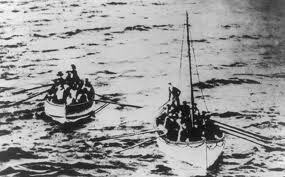 Speaking of the survivors: the lifeboats had room for a couple of hundred more people but they remained empty. They refused to go back and pick people up because they were afraid they would be swamped and capsized. Could you live with yourself if you were in that situation and didn't go back to pick up children - or your own family members or friends who were out there dying? Is it any different if we escape from a obese death and do not offer back help to those still floundering in the ocean of Obesity? The difference is we can bring the lifeboat to them, but they must be the ones to climb aboard. We cannot fish anyone out of the sea if they will not expend their own efforts to survive. We can't re-write history. We can just change the angle at which we view it. What can you do to help someone on the disaster ship Obesity become a survivor? I have a whole pile of email addresses, which people sent me for going private, that the system will not load from what I can tell. Yours is one of them. I think our words are the most powerful thing we can offer. Vickie - I cannot see it. I think I sent you the keeping the pounds off email address? it is my only gmail address. But I think my blogger address is my first and last names at yahoo. But I hate that address and do not want to use it. Let me talk to my daughter and see if I need to switch something. Vickie - I checked and my blogger email is also the gmail address, NOT a yahoo address. I've never been a Titanic buff, but I appreciate the analogy. Except that if I don't go back for the others still in the water, the lifeboat I'm on will slowly start to leak, and ultimately sink as well. A great analogy. 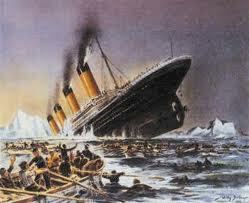 Saving the sinking is what we here at Over 40 - So What have been working toward. I have found that the best way to influence others is to be a shining example. A visual is always better than reading a story, that's why the photos at the top of your blog have such a huge impact. You have inspired us to post our before and after pictures. Have lots of fat before pictures from 4 or 5 years ago. Now we need to get some current afters. Thanks for your inspiration. I know you have helped many people. bbubblyb - Dawn - I disagree. Words can be used as lies or just distored. It has to be our example walking the walk, just not talking the talk. Over 40 - the after photos are essential. We are first attracted with our eyes. That even makes more sense. You cannot force someone to be saved - not from anything.